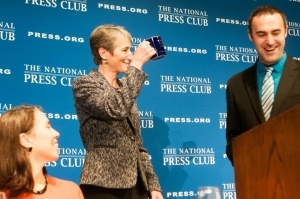 Interior Secretary Sally Jewell receives the traditional NPC Mug from Board of Governors Chair Thomas Burr at a National Press Club Luncheon, October 31, 2013. Also pictured, Alison Fitzgerald, Speakers Committee Chair. Congress must pass a budget that funds successful programs that protect public lands, Interior Secretary Sally Jewell told a National Press Club audience Thursday, Oct. 31. The 16-day "absurd, wasteful" government shutdown earlier this month and a 5% budget cut earlier this year have taken a toll on the agency, said Jewell, who started work at the Interior Department in April. National parks lost millions of in fees during each day of the shutdown and scientific research by such agencies as the U.S. Geological Survey paused, she said. Jewell also announced a new Interior Department initiative aimed at bridging the divide between young people and nature. The programs are designed to inspire young people “to play, to learn, and to serve in the great outdoors." The next generation must learn the importance of stewardship of public lands, Jewell said. The millennial generation, ages 18 to 33, outnumber the baby boomers by three million, but are increasingly more disconnected from the natural world like never before, Jewell said. The nation must work now to establish a “meaningful connection between young people from all backgrounds, in all parts of the country, and the great outdoors,” she said. Jewell, who left her job as CEO of outdoor retailer REI to lead Interior, said she wanted "to seize the opportunity to make a difference" on defining issues such as climate change, energy independence and conservation. A growing population, climate change and "constrained resources" are putting increasing demands on landscapes and waterways, she said.